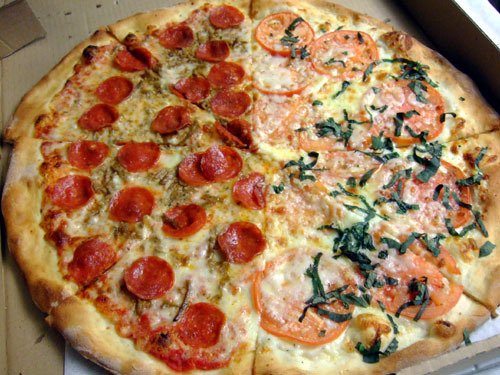 Many native New Yorker contemptuously refer to pizza in California as cardboard with tomato sauce. 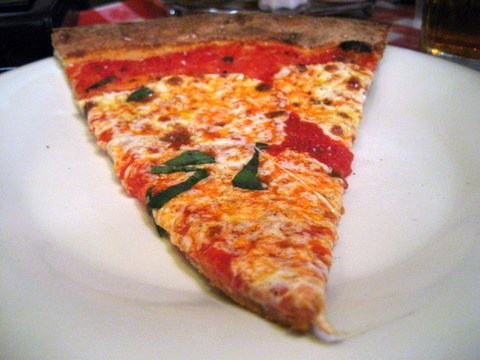 As a native Californian I was curious, how good was the pizza in New York that it inspired such a reaction in people. 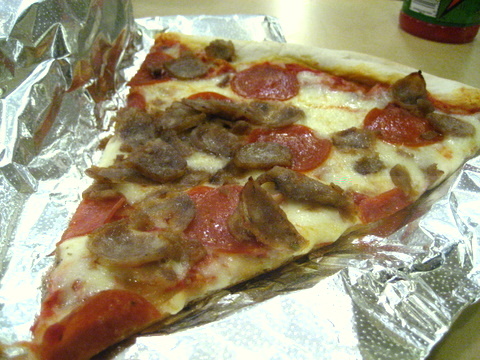 Our first stop was at the ubiquitous Ray's Pizza, in this case a Famous Original Ray's. Interestingly enough there are a number of competing chains with the Ray's name and similar logo. One would think this would be a case of copyright infringement but somehow the distinct chains remain. We decided to stop at this particular Ray's because it was close to Carnegie Deli where we just had lunch. One thing I noticed is the pizza is left sitting out after being cooked once. When ordered they pop it in the oven to cook again. I've seen this done at a couple places in California but my coworker from New York stressed the difference is freshness. He claimed the pizzeria in New York got so much traffic that the pizza was inevitably always fresh, though it looked to me like this wasn't the case. We ended up ordering a slice of pepperoni and sausage. 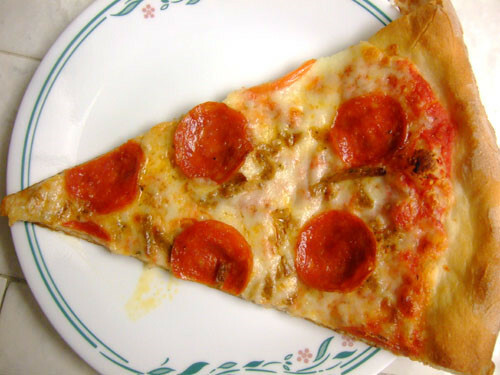 The pizza was surprisingly lackluster, I honestly wonder how this chained spawned the number of copycats that it did. Yes the pizza was crisp, but beyond that I didn't notice anything remotely redeeming about it at all. 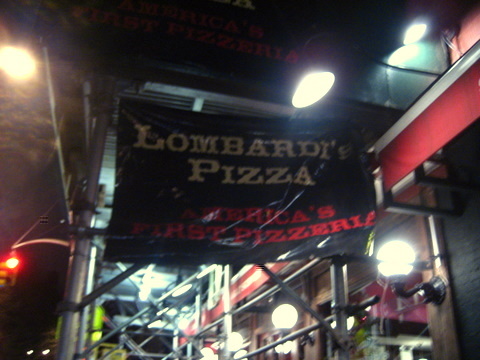 Our second stop was at Lombardi's, billed as the first pizzeria in the United States and the birthplace of New York style pizza. 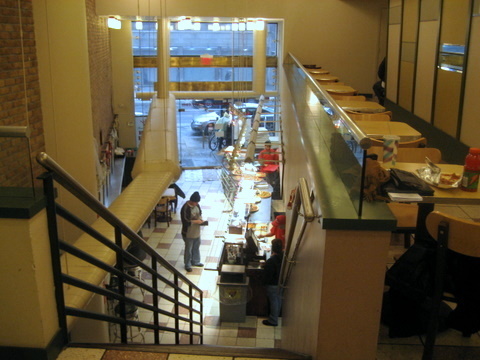 The restaurant has expanded over the years, adding a bar and larger dining room that gives the restaurant a more comfortable feel. 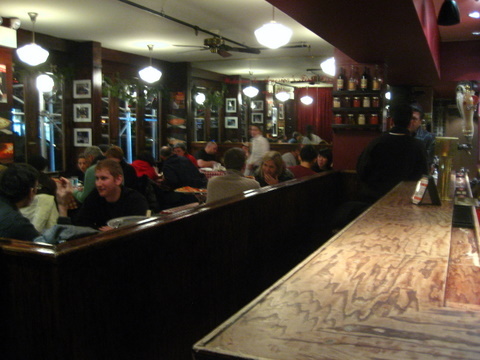 The original dining room is extremely cramped with barely enough space to walk between the tables. Still there is typically a wait in order to get a table. 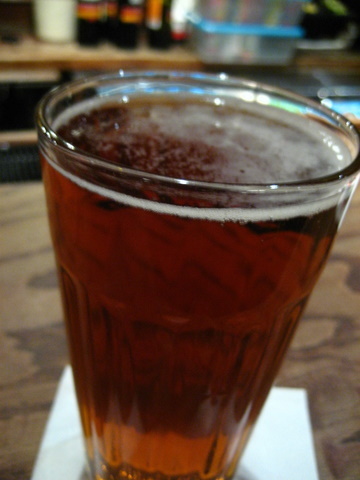 We spent our wait at the bar, despite still fighting off the lingering effects of food poisoning I felt I was good enough to have a beer. Seeing as we were in the first pizzeria I felt a beer from America's oldest brewery was in order. This was my first experience with Yuengling and I thought it was a fairly typical American lager, very nondescript and approachable. We were considering trying the clam pie but I decided against it fearing that it would be too much for my stomach to take. Instead we went with the original and decided to add pepperoni and the restaurant's homemade meatballs to half the pizza. 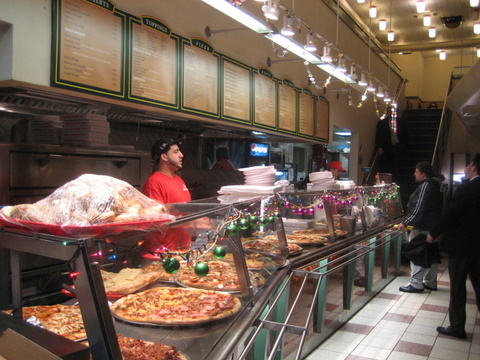 Lombardi's pizza is known for its crust with a distinctive smoky bitterness that is said to be the result of the coal powered oven and the New York City tap water. The homemade meatballs might be the best topping I have ever had on a pizza and the sauce added a vibrant tartness that complimented the crust and toppings beautifully. One can't help but be impressed by the history behind Lombardi's and that invariably affects the experience. Still this has to be one of the most distinctive and delicious pizzas I have had in a long time. 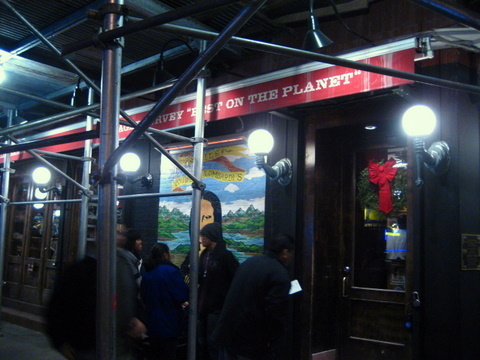 Unlike what I had at Ray's, I can see how this one humble restaurant started America's love affair with pizza. 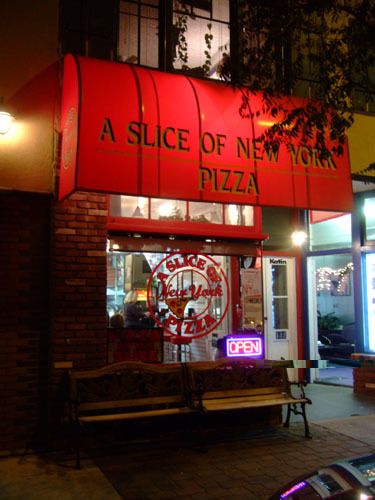 I know it isn't technically in New York but it is one of the better New York style pizzas in California, even my coworker from New York agrees. 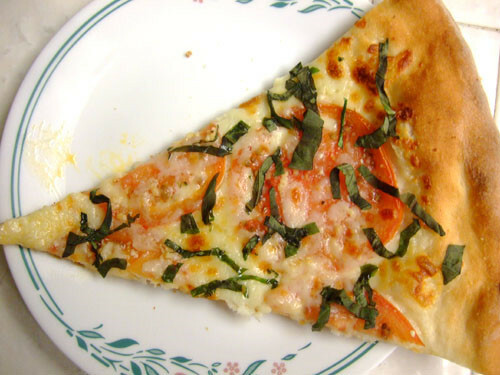 His main complaint is that the pizza is partially cooked and left out and reheated when ordered and with the limited traffic sometimes the slices aren't as fresh as they should be. We avoided the freshness problem this time by ordering a whole pie. 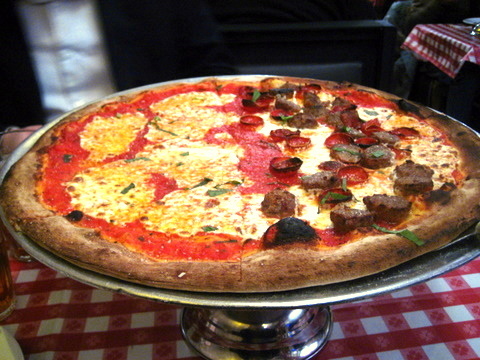 We did our best to emulate the pizza we had at Lombardi's: one half Margherita and one half pepperoni and meatballs. The Margherita was delicious with its creamy sauce and juicy tomatoes; however the meats lacked the subtle flavors of those at Lombardi's. It isn't quite up to the level of Lombardi's but the pizza definitely outdid the stale boring pies at Ray's. Famous Original Ray's (or any other establishment whose name that contains two of those words) is synonymous with mediocre pizza, with the possible exception of the Ray's on Prince St. They're almost always too doughy and covered with an excess of sub-par cheese. 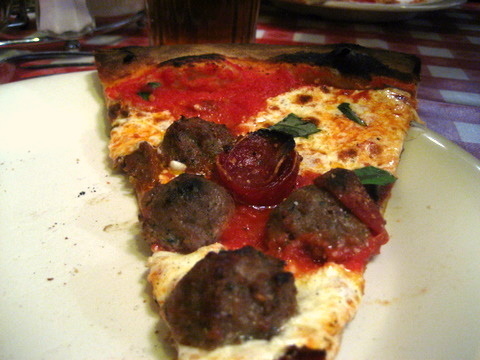 If you'd like a primer to the best NY pizza spots, I'd recommend checking out the blog slice.seriouseats.com. Also, I know this may sound hard to believe, but cooking and reheating slices is actually part of the magic of New York pizza. The second heating, if done right, should crisp up the crust nicely, much like a second trip to the fryer makes Belgian fries that much more crispy. In LA, it appalls me when places like Village Pizzeria on Larchmont undercook their slices and then claim to finish cooking them when they heat them for you. Not only does this take too long (10 minutes vs. 4 or 5 tops for a slice in NY), you can't properly bake or crisp the crust this way. I find many transplanted New Yorkers are passionate about their pizza. I always welcome more knowledge and insight into food. 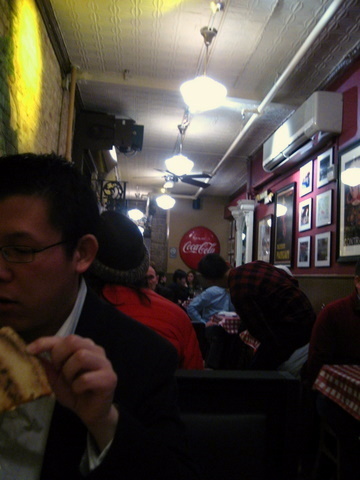 I would really like to try more pizza places in New York. I simply had to try one of the Ray's because it is so ubiquitous. Thanks for the site. I will definitely try some of the places on that list. 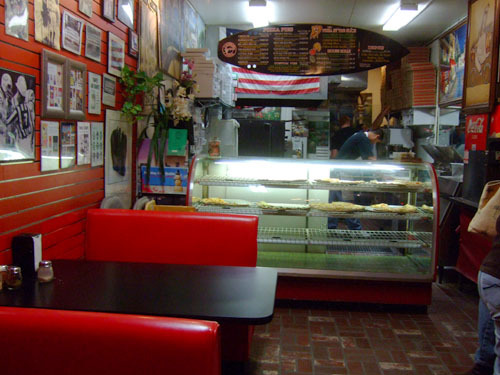 I wanted to do Di Fara's last time but couldn't make it out. How would you compare Lombardi's to Mozza's?